Posted on August 22, 2013 by Maya S.
Bomb is a breath-taking, emotional book by Steve Sheinkin that shows the three-way race to building an atomic bomb in World War II, and while the war was going on, the race to find Uranium, TNT, and hydrogen. From FBI agents to spies, everybody is trying to find out how far each team is, where their supplies are hidden, and what their plan is. The three racers, the Soviet Union, the Americans and the Germans, start off. First the Germans give up, and then the Soviet Union is trying hard. They give up and the Americans drop the first bomb blowing up a city. Ultimately the Soviet Union is trying to make a super bomb that could destroy the earth eight times. Welcome to the race of the Manhattan Project. The story starts out with a prologue showing what happened at the very end, getting the reader excited and mystified. Then it shows the beginning life of a little boy named Robert Oppenheimer, a German, who later became one of the most successful scientists in making the atomic bomb. He was very focused on education. As he grew older, he became a teacher. The Great Depression had started, and he didn’t notice until ten years after it had begun. Some new scientists by the names of Lise Meitner, Otto Hahn, Fritz Strassmann, and Otto Robert Frisch discovered a new scientific process in 1938 which could destroy human nature by taking one atom and shooting it at a Uranium atom which splits and causes fission this process was the basis in making the atomic bomb– hence the word atom. Scientists all over the world heard about it, and rumors went flying that someone could create an atomic bomb. Meanwhile the Americans were starting to get some ideas, and some scientists researched ‘Einstein’ for inspiration. Mr. Albert Einstein was found, and he agreed to help them not knowing what they will use the bomb for, later regretting he had ever joined the team in the first place. The FBI caught on. This mission was top secret, the innocent American public did not know, but there was one person who needed to know: Mr. Franklin Delano Roosevelt, the President. Meanwhile, the Germans and the Soviet Union were weakening under the pressure of the war started by Hitler. They began coming into the United States to try to find some information and steal the ideas from the Americans. Stealing each others’ supplies created a tense situation all the way to the end. 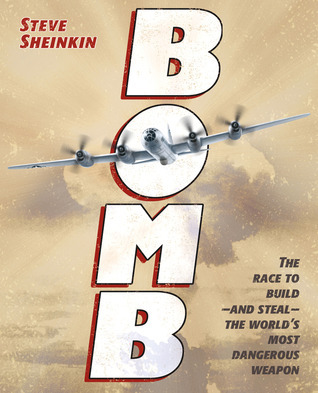 Using action, emotion, and high-quality writing, Steve Sheinkin‘s book Bomb was a fabulous, hard-to-put down book. And you would have never guessed it was a true story. This entry was posted in Book Reviews and tagged book review, nonfiction, steve sheinkin by Maya S.. Bookmark the permalink. This book seems very interesting! The time period as well as the historical events occurring do make it quite intriguing! Thanks for sharing!